Boho brides who love fringe, feathers and tassels will be obsessed with these enchanting dreamcatcher details. First there was lace, then there was fringe, and now dreamcatcher details are the latest addition to boho wedding dress style. In Native American cultures, dreamcatchers are said to protect against negative forces, bad dreams, and even to represent the circle of life. 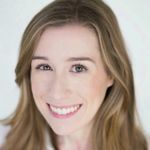 Authentic dreamcatchers often include sacred and personal items, like beads, feathers and charms, and each part of a dreamcatcher signifies something different. 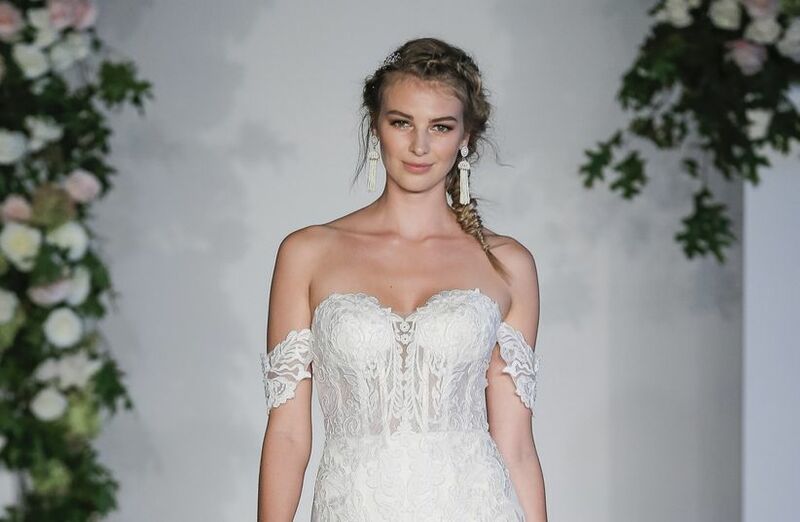 While there weren't any actual dreamcatchers at New York Bridal Market this season, we saw designers incorporating beautiful dreamcatcher-inspired details into their dresses. Bohemian brides, we think you'll love this new take on earthy, free-spirited style. Take a look at these gorgeous boho wedding dress styles with dreamcatcher details. We're loving the beaded tassels, floral prints and lace-up details on this Julie Vino design. We can't resist a good open-back dress, especially one that ties with tassels. This lace and net dress is from Wilderly Bride, the brand new collection by Allure Bridals. The sheath silhouette is ultra-flattering and would be perfect for an intimate beach wedding. Long detachable sleeves transformed this sheath Idan Cohen gown into something fit for a boho goddess. With three different lace patterns and an illusion bodice, this look is no doubt a showstopper. 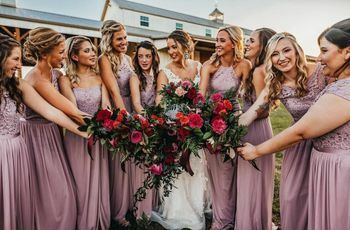 Rish Bridal took the dreamcatcher trend to another level with the Renee dress, which has tiers of fringe trim that looks like actual miniature dreamcatchers. Two delicate feather tassels were added on one shoulder for good measure. Not every boho wedding dress has to be covered in lace or flowers. 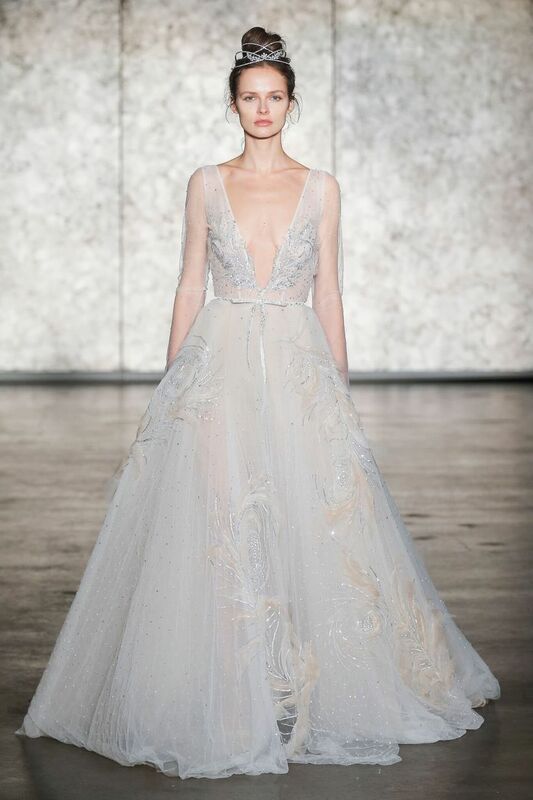 We're getting serious bohemian princess vibes from this tulle gown embroidered with sparkling feather motifs. As we first saw last season at New York Bridal Market, wedding dresses with spaghetti straps are back in style. This dreamcatcher-inspired beauty has a playful lace and tulle combo and also incorporated the botanical wedding dress trend with greenery embellishments on the bodice. 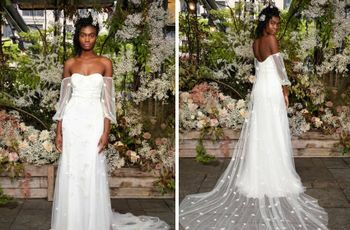 The debut collection from Desiree Hartsock Bridal is quite literally called "Dreamcatcher," so of course we had to include it in our roundup of favorite boho wedding dresses from this season. We're totally smitten with the fringed beading and feather details on the back of this halter neck dress. Free-spirited brides, get ready to fall in love. Lace-up details and a thigh-high slit give a bit of edginess to this lacy Willowby by Watters dress. The lace-up back on this crop top reminds us of the webbed pattern on a dreamcatcher. David's Bridal paired it with wide-leg pants for an edgy, boho-chic look. A touch of sparkle makes this boho wedding dress perfect for any bride who also loves glam style.